From the Departments of Neurology (R.K., C.S., P.S.) and Radiology (F.R. ), University of Kentucky, Lexington. A 22-year-old woman presented with photopsia, sensory loss, and paresthesia over both lower extremities, visual scotomas, and painless binocular vision loss over 5 months. 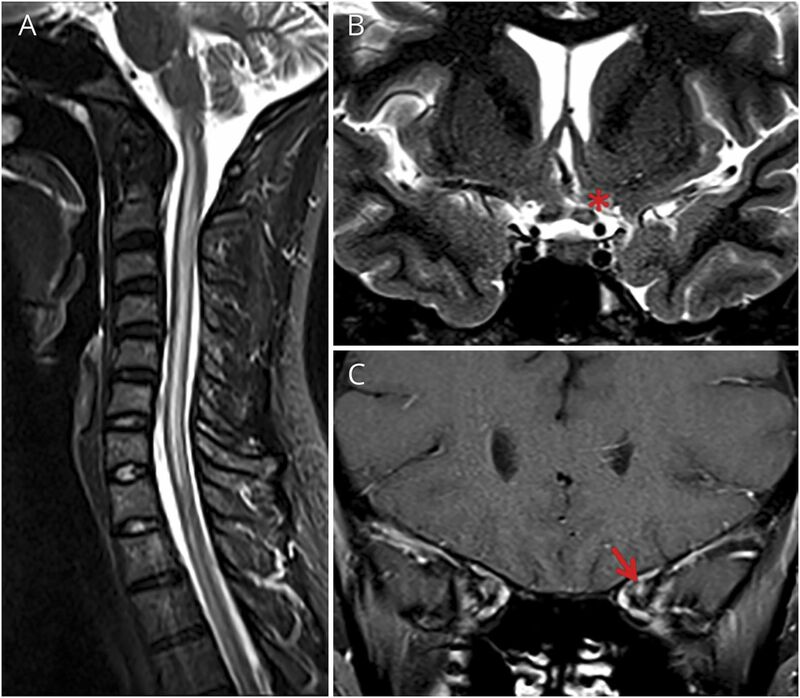 MRI showed T2 hyperintensities near the optic chiasm (figure 1, B and C), floor of the fourth ventricle and the colliculi (figure 2, A–F), and central gray matter of the spinal cord (figure 1A). CSF analysis was notable for elevated glucose and lactate; oligoclonal bands, immunoglobulin G index, and aquaporin-4 antibodies were negative. Her maternal uncle has Leber hereditary optic neuropathy (LHON) and a genetic analysis confirmed an m.3460 G>A mitochondrial DNA point mutation. Sagittal T2-weighted images of the cervical spine (A) show extensive gray matter hyperintensity in the spinal cord and mild swelling. Coronal T2-weighted images of the orbits (B) show central hyperintensity in the optic nerves near the chiasm (asterisk). Coronal postcontrast T1-weighted images (C) show enhancement of the apical segment of the left optic nerve (arrow). 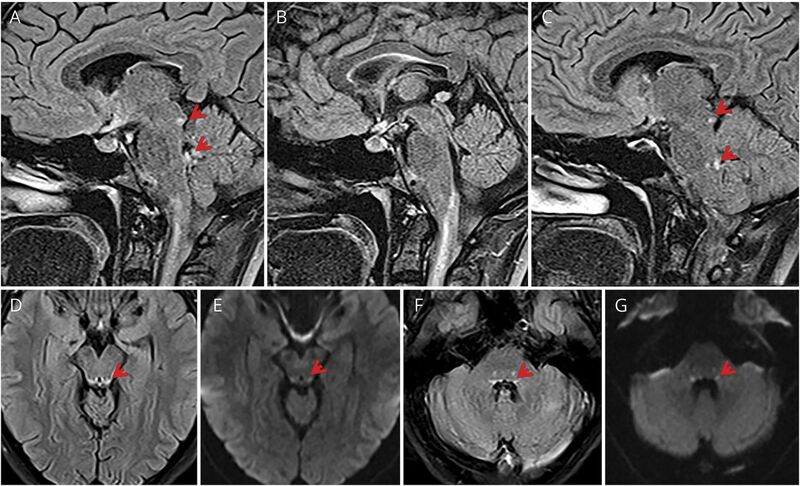 Sagittal T2-weighted fluid-attenuated inversion recovery (FLAIR) images of the brain (A–C, left to right) and axial T2-weighted FLAIR images (D and F) show symmetric hyperintensities along the floor of the fourth ventricle in the region of the vestibular nuclei and in the colliculi (arrowheads). Axial diffusion-weighted imaging (E and G) shows corresponding restricted diffusion. There is edema in the visualized cord (B). LHON commonly presents with subacute bilateral vision loss due to free radical oxidative injury causing selective retinal ganglion cell loss.1 However, Leber “plus” disease with combined optic neuropathy and extensive myelopathy is rare.2 The mechanism of cord injury is unknown. Roman Kassa: study concept and design, acquisition of data. Flavius Raslau: analysis and interpretation of data. Charles Smith: study concept and design, acquisition of data. Padmaja Sudhakar: study concept and design, acquisition of data.
. Mechanisms of retinal specific-cell death in Leber hereditary optic neuropathy. Trans Am Ophthalmol Soc 2007;105:379–391.
. Leber hereditary optic neuropathy mimicking neuromyelitis optica. J Neuroophthalmol 2011;31:265–268.